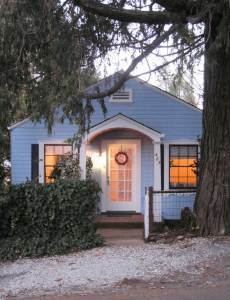 This two bedroom, 1.5 bath cottage is a charmer … and conveniently located just a one minute walk from the center of historic downtown. You are sure to enjoy your stay in this delightfully furnished home! Full kitchen with all basic cooking amenities. Backyard garden/outdoor dining area, bbq, covered back porch, wireless internet, phone, cable, DVD, washer/dryer. Sleeps 4.